Dante Lam‘s (林超賢) latest film That Demon Within <魔警> came in at number one at the box office during its opening week. The psychological thriller earned $7.9 million HKD over just four days, dethroning Hollywood blockbuster Captain America: The Winter Soldier and proved that homegrown films still command an audience. 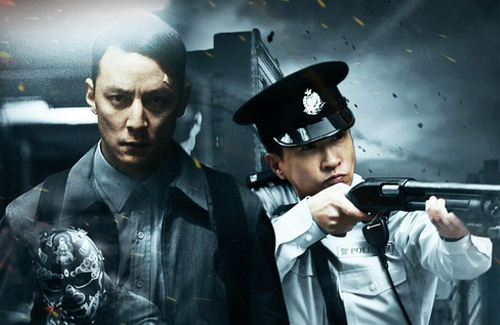 A refreshing collaboration between Lam, Nick Cheung (張家輝), and Daniel Wu (吳彥祖), That Demon Within stars Daniel as disillusioned cop Dave Wong, who stands guard at a hospital. He unknowingly saves notorious crime thug Hon Kong (Nick Cheung) from his injuries when it was discovered that they had matching blood types. Dave later learns of Hon’s identity and vows vengeance as Hon had caused the deaths of many of his colleagues. As if their souls have become intertwined after the blood transfusion, Dave is gradually taken over by violence and rage, and must fight against himself as he hunts down the psychotic killer. For his role, Daniel reportedly lost nearly 40 pounds within two months on a starvation diet. He also suffered mood swings off the set, though wife Lisa S. was understanding and provided attentive care despite her pregnancy. Nick also put his life at risk, opting to film the fiery sequences without a stunt double. The action-heavy film made its global debut at the 64th Berlin International Film Festival in February and enjoyed positive reception. Director Lam is happy about the box office figures, though he is currently in Italy and is unable to celebrate with his cast. Nick Cheung is also thankful for the good results and stated that his role was a new challenge. Daniel, who is currently in the United States, has been keeping an eye on the box office from across the Pacific. Excited about the film’s success, he thanked movie-goers on his Weibo and urged others to see the film and provide feedback. Nick looks quite good in this, but Daniel, as always, looks boring. Really don’t like his “acting”. Still looking forward to watching this. Same actors over and over again. It’s worse than dramas. HK has a shortage of actors and new faces. Partly the fault of audiences who prefer established big-name stars. U are lucky u are not in Thailand, we also have same actor in every movie but the worst part is that he is not even a good actor and not even thai nationality.